A fully stocked cigar shop humidor can be intimidating, even for the savviest of cigar smokers. The sheer amount of brands, bright packaging and creative vitolas can leave a customer paralyzed by choice. To help save you time (and money) when you're searching for the perfect cigar, the editors of Cigar Aficionado have chosen top cigars from our most recent blind tasting. The tasting, which appeared in our December 2016 issue, rated 83 cigars in total, with 17 non-Cuban cigars scoring 90 points or higher. 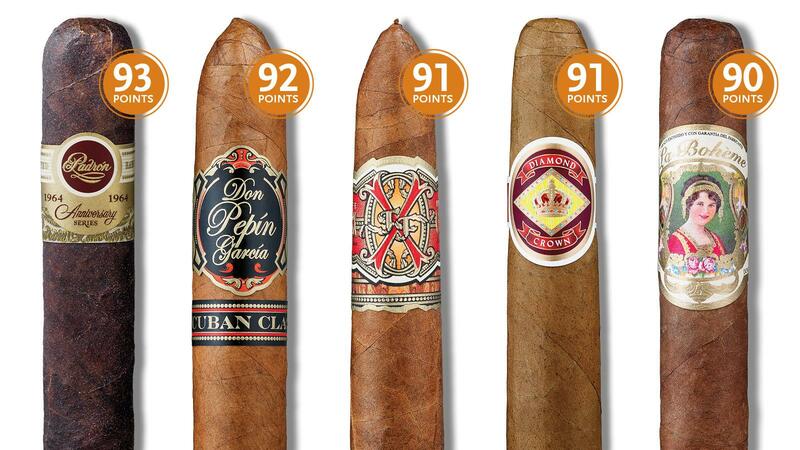 These cigars are considered outstanding on our 100-point scale. Like all Cigar Aficionado tastings, the editors consider four different categories when determining a cigar's rating. Appearance and structure counts for a maximum of 15 points; flavor and smoking characteristics (quality of draw, texture of smoke, etc.) count for 25 points each; and the remaining 35 points are allotted to the overall impression, or level of enjoyment, of the cigar. Padrón 1964 Anniversary Series Hermoso Maduro (93 points, Nicaragua) Last year, Padón added the Hermoso size to its 1964 Anniversary Series, which comes in both Natural and Maduro. It's the first new, regular-production size added to the brand since 2012, when the No. 4 was released. See full tasting note. Don Pepin Garcia Cuban Classic 1970 (92 points, Nicaragua) The Don Pepin Garcia Cuban Classic debuted in late 2006 and were among the first cigars produced by Garcia after moving his production from Miami to Nicaragua. The 1970 size is a belicoso, measuring 5 1/2 inches by 54 ring gauge, offering a complex array of mesquite and hickory qualities. See full tasting note. E.P. Carrillo Short Run 2016 Super Robusto (92 points, Dom. Rep.) In the past, the E.P. Carrillo Short Run was typically a small-production annual release. Unfortunately, new FDA regulations have made it difficult for cigarmakers to release small-production smokes, and E.P. Carrillo says this will most likely be the last Short Run cigar. But there is a silver lining: he has added the Short Run 2016 to his regular-production portfolio. See full tasting note. Las Calaveras Edición Limitada 2016 LC50 (92 points, Nicaragua) Since 2014, cigar company Crowned Heads has released an annual limited-edition brand called Las Calaveras. In previous versions, Las Calaveras wore an Ecuadoran wrapper, but this year, the cigar is draped in a dark, Connecticut broadleaf wrapper. See full tasting note. Fuente Fuente OpusX Love Affair (91 points, Dom. Rep.) Some of the world's most talented cigarmakers roll special shapes of Fuente Fuente OpusX. The Love Affair, a masterfully-rolled perfecto with a pointy tip and tapered foot, is a pristine example of OpusX craftsmanship. See full tasting note. Diamond Crown Figurado No. 6 (91 points, Dom. Rep.) The Figurado No. 6 is among the most uniquely-shaped vitolas in the Diamond Crown portfolio. The cigar is impeccably rolled, with voluptuous curves and tapers, and wears a yellowish Connecticut-shade wrapper. See full tasting note. CAO Pilón Corona (90 points, Nicaragua) CAO's Pilón brand is named after the age-old practice of arranging tobacco for fermentation. This solidly-rolled corona is not only impeccable in appearance and gleaming with oil, it's also a great value: $5.99 per cigar. See full tasting note. The Edge Corojo Toro (90 points, Honduras) When Rocky Patel first released The Edge in 2004, the concept was simple: a roughly hewn wooden box that held 100 unbanded cigars. After the success of the original blends—Corojo and Maduro—Patel added an identifying footband and new varieties. See full tasting note. La Bohéme Mimi (90 points, Dom. Rep.) Cigarmaker and music-lover Rafael Nodal named his La Bohéme brand after the Italian opera composed by Giacomo Puccini. The sizes—including the short-and-squat Mimi—are named after characters from the classic opera. See full tasting note. Arturo Fuente Don Carlos No. 3 (90 points, Dom. Rep.) The Don Carlos brand is named for Fuente family patriarch Carlos Fuente Sr., who passed away this summer at the age of 81. But his innovative cigar blends live on, including the recently tasted No. 3 vitola, which offers delicate notes of fruit and nuts. See full tasting note. La Flor Dominicana Double Ligero Chisel (90 points, Dom. Rep.) As the self-proclaimed "Home of the Ligero," it's no secret La Flor Dominicana prides itself on its full-flavored smokes. But Litto Gomez's storied brand is also famous for a unique vitola known as the Chisel, which draws quite well despite its esoteric shape. See full tasting note. Murcielago La Lune (90 points, Nicaragua) The Murcielago brand debuted in 2009 and was made by José "Pepin" Garcia in Nicaragua—but those cigars were only on the market for about a year and a half. In 2015, Espinosa Premium Cigars brought the brand back, and it's now made at Espinosa's La Zona factory in Nicaragua. See full tasting note. Flores y Rodriguez Connecticut Valley Reserve Gran Toro (90 points, Dom. Rep.) Abe Flores of PDR Cigars released the Flores y Rodriguez Connecticut Valley Reserve in late 2015, and as the name suggests, it's wrapped in a dark Connecticut broadleaf maduro wrapper that's grown in the United States. In a recent Cigar Insider vertical tasting, three vitolas, including the Gran Toro, received scores of 90 points or higher. See full tasting note. Cornelius & Anthony Daddy Mac Toro (90 points, Nicaragua) Cornelius & Anthony brand owner Steven Bailey likes to pay tribute to his family's 150-year history of growing tobacco in Virginia. Daddy Mac, his second premium brand, honors the memory of Bailey's father, Mac Bailey, who is depicted on the cigar box riding through a tobacco field on his tractor. See full tasting note. Warped Futuro Selección Suprema (90 points, Nicaragua) Warped Futuro was born out of a collaborative blending project between Warped Cigars brand owner Kyle Gellis and Max Fernandez of Casa Fernandez. The name futuro was chosen by Gellis and Fernandez as it is Spanish for the word "future." The pair see themselves as part of a young generation of cigarmakers. See full tasting note. Eiroa 48x4 Prensado (90 points, Honduras) Eiroa is a mainstay cigar brand from Christian Eiroa, industry veteran and former president of Camacho Cigars. After Camacho was acquired by Davidoff in 2008, Eiroa left the industry before returning in 2012 with the formation of CLE Cigar Co. This quaint, box-pressed little cigar is a Honduran puro. See full tasting note. Graycliff Crystal Presidente (90 points, Bahamas) Tobaccos from four nations are exported to Graycliff's facilities in the Bahamas to create this large, Churchill-sized cigar. It's a balanced smoke with an easy draw and wears a dark, Ecuadoran wrapper leaf. See full tasting note.